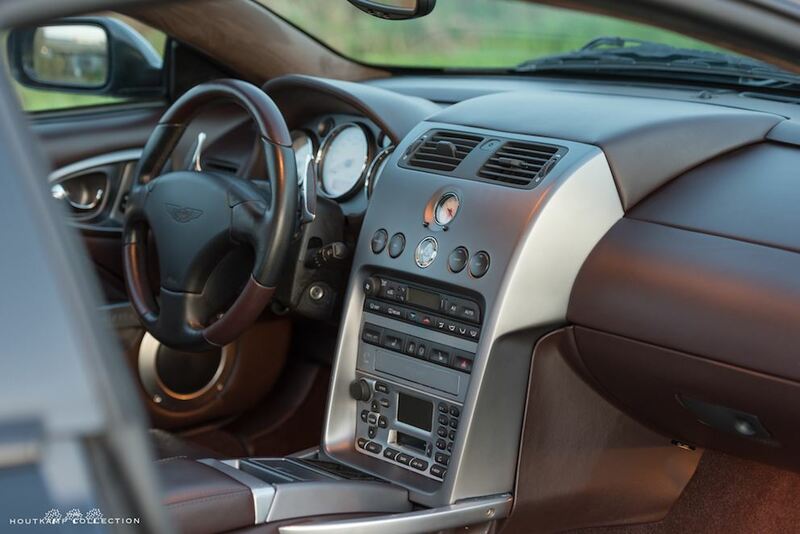 An entirely new Aston Martin for the 21st Century, the Vanquish debuted at the Geneva Auto Show in March 2001, with deliveries commencing a few months later. 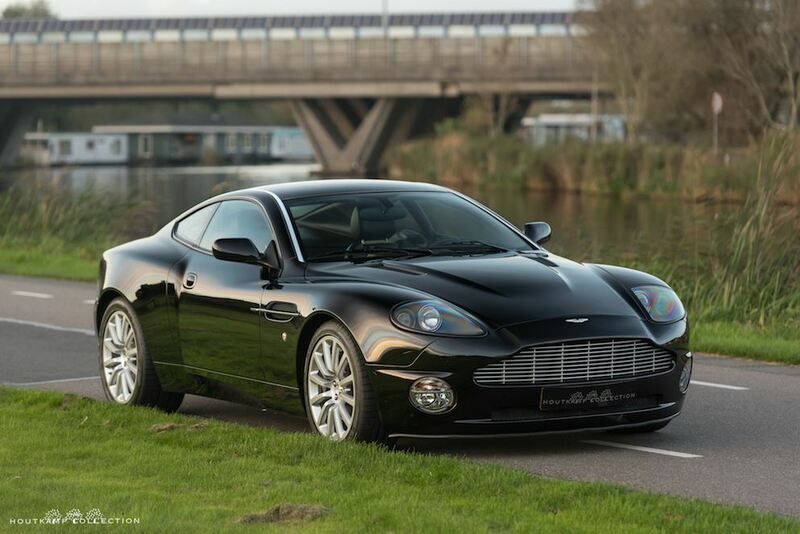 The Vanquish took over from the Vantage V8, the Newport Pagnell factory undergoing an extensive multi-million pound refurbishment to accommodate it, gaining a new assembly line, paint shop, rolling road and water test facility. 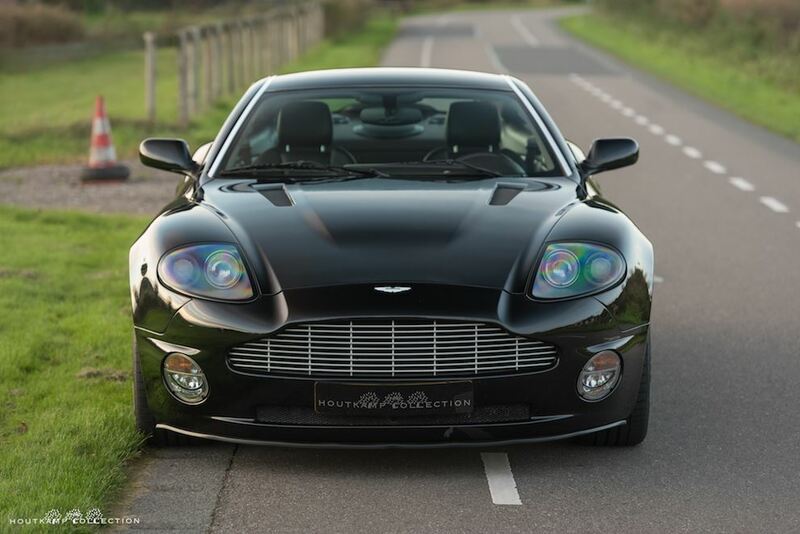 Styled by Ian Callum, the man responsible for the extremely successful DB7, the Vanquish was developed with assistance from Aston Martin’s parent company Ford using constructional techniques which were more advanced than those of any other road car. The monocoque tub was made of heat-cured bonded aluminium, braced by a central tunnel of carbon fibre to create a lightweight structure of exceptional rigidity, thus enabling the chassis engineers to develop suspension combining excellent handling and roadholding with unrivalled ride quality. 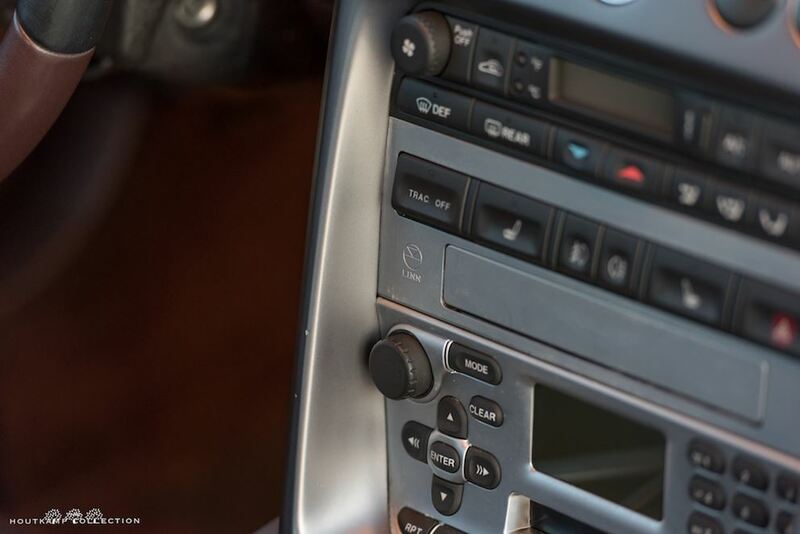 As well as its superior strength/weight ratio compared to aluminium, the carbon fibre backbone also provided better insulation from transmission and exhaust heat in the cabin. The all-independent suspension followed the accepted supercar norm and comprised double aluminium wishbones, coil springs, mono-tube damper and anti-roll bar front and rear. Four-wheel ventilated steel disc brakes gripped by four-piston callipers provided all the stopping power one needs, while ABS and traction control afforded maximum security in poor road conditions or ‘on the limit’. 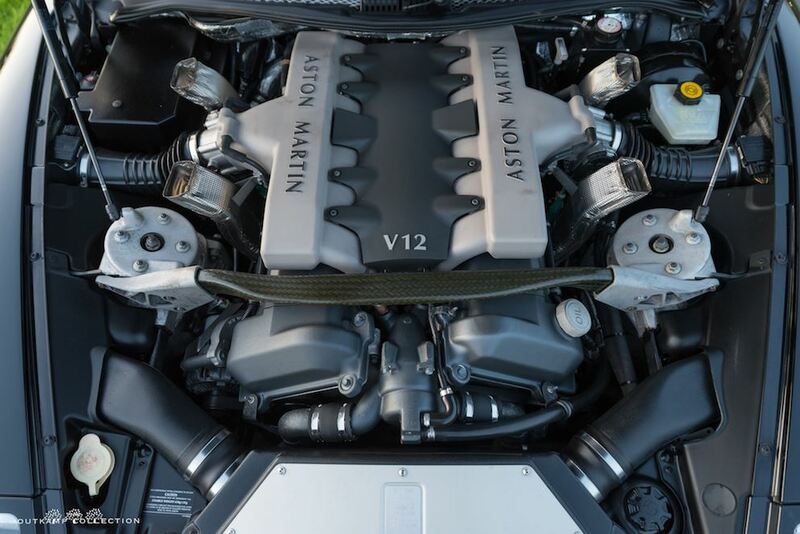 Aston Martin’s first power unit of its type, the 6.0-litre, 48-valve, V12 engine developed 460bhp at 6,800rpm, with 400lb/ft of torque available at 5,500 revs. 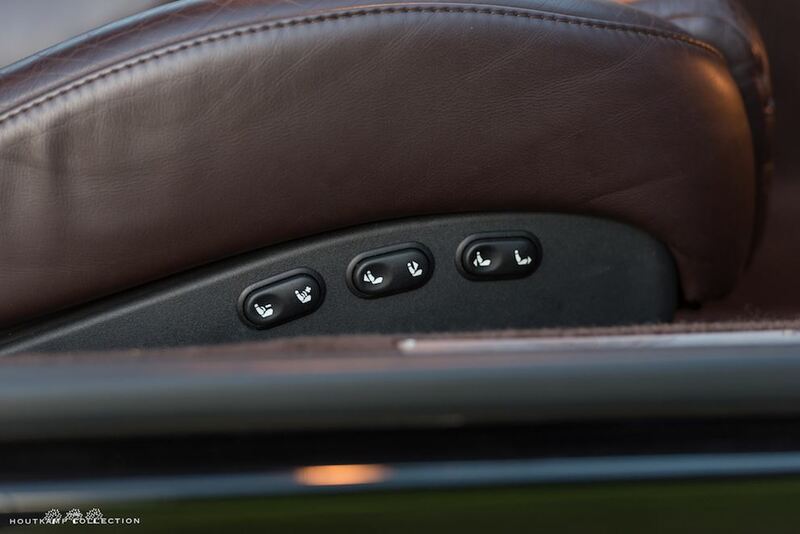 The gearchange is controlled by F1-style paddles and could be operated in either of two modes – fully manual and computer-controlled automatic – with a ‘sport’ setting available on both. 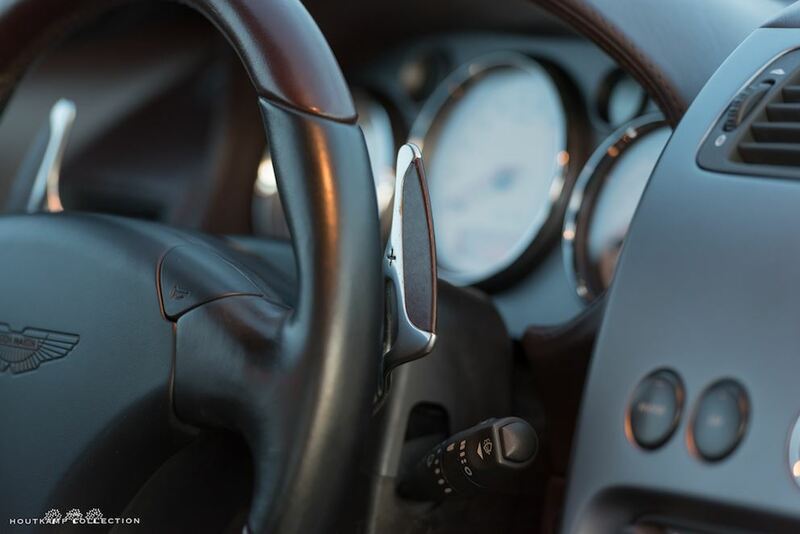 The system allowed the driver to skip intermediate gears on down-changes without recourse to the clutch, while at the same time providing engine protection by means of a rev limiter. All emissions requirements worldwide were surpassed, including California’s LEV (Low Emission Vehicle) standards. Standard equipment inventory included almost everything the discerning connoisseur would wish for: Alpine stereo system, 6 CD changer, air conditioning, electrically adjustable seats, alarm/immobiliser, tyre pressure sensing, automatic rain-sensing wipers, automatic headlamp operation, automatic rear-view mirror dipping, trip computer, etc. The performance? 190mph and 0-60 in 4.5 seconds. 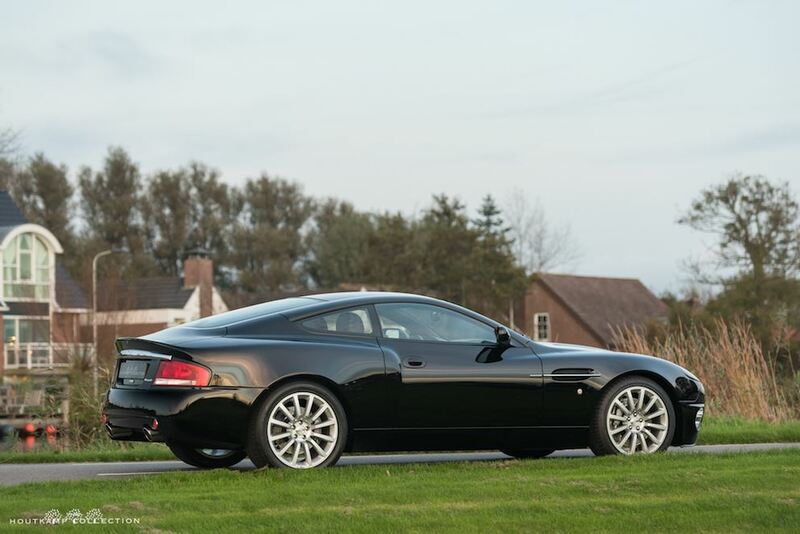 The Vanquish was built like all other Astons before it, one at a time, by hand. 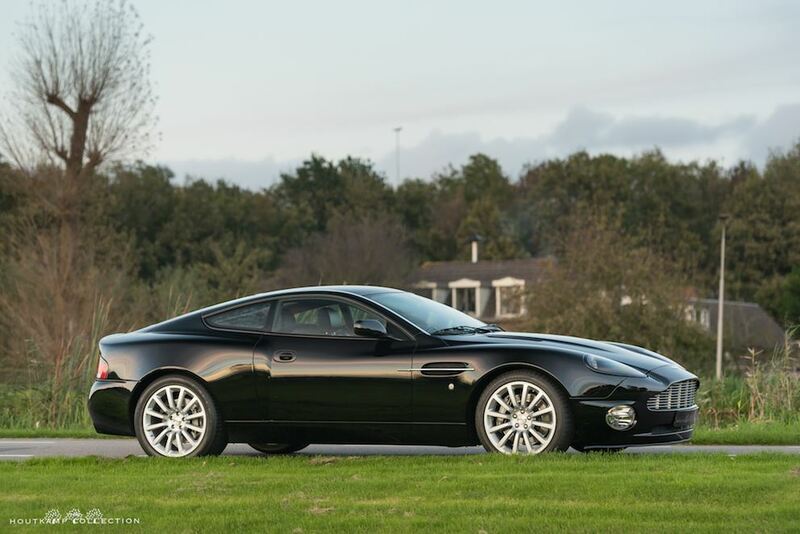 Production ceased in 2007, by which time the model had been upgraded as the Vanquish S and the UK list price had risen to over £183,000 (approximately €219,000 at today’s rate of exchange). 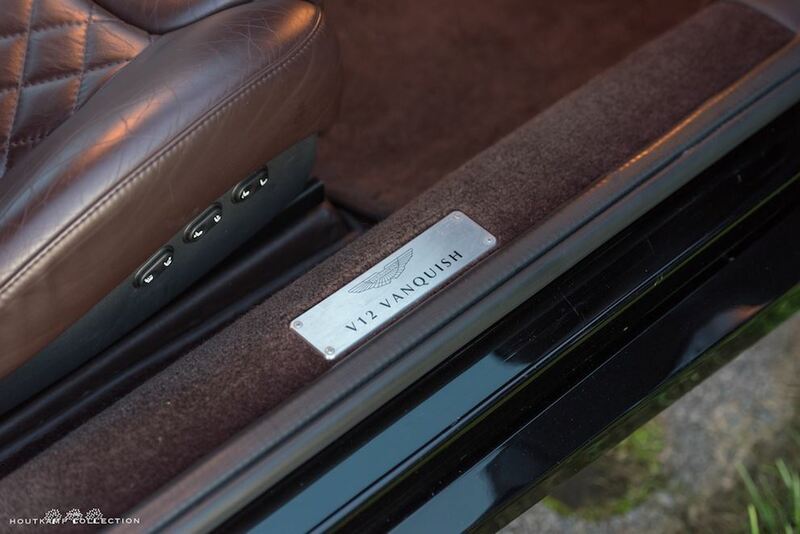 The Vanquish is yet another ‘James Bond’ Aston Martin, having featured in ‘Die Another Day’ starring Pierce Brosnan as the eponymous secret agent. 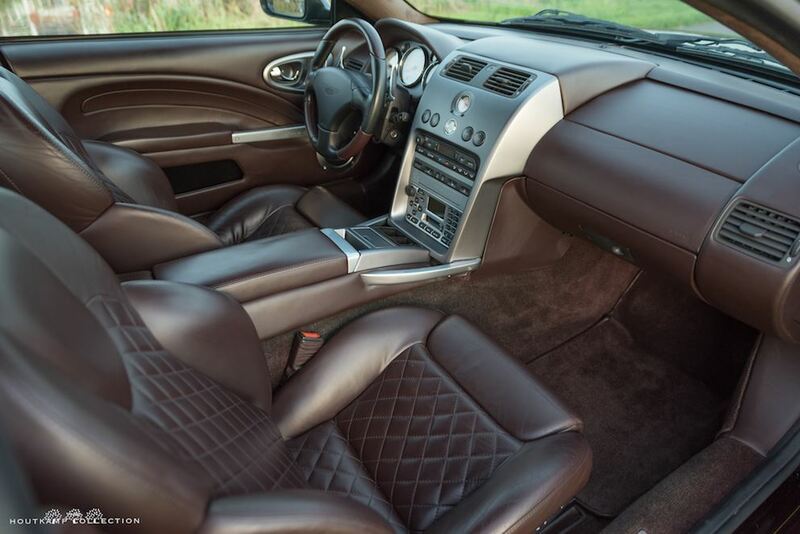 This particular car, chassis number ‘501385’, is finished in Black with an extremely beautiful Dark Brown interior. 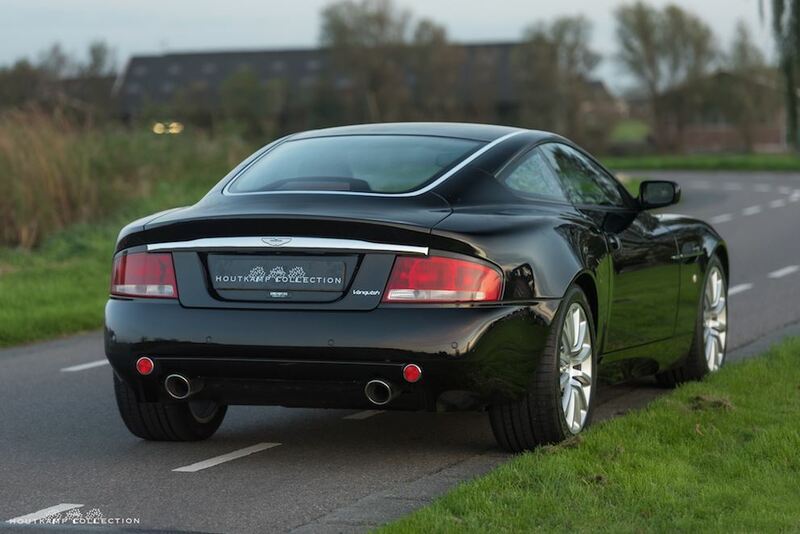 The car is newly delivered in Holland at the 28th of April 2004 and is therefore a desirable first series example. 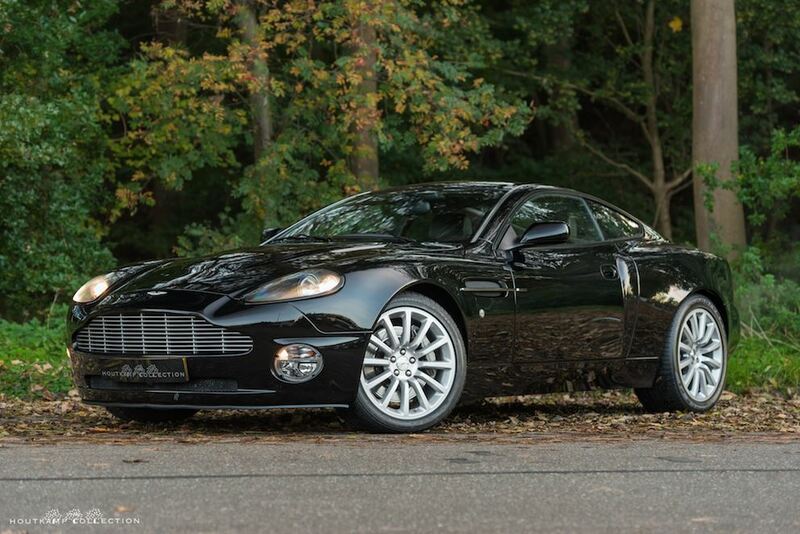 The Aston has been regularly maintained at the Aston Martin dealer and remains in generally very good condition, commensurate with its pretty low mileage of only 82,000 since its first registration. 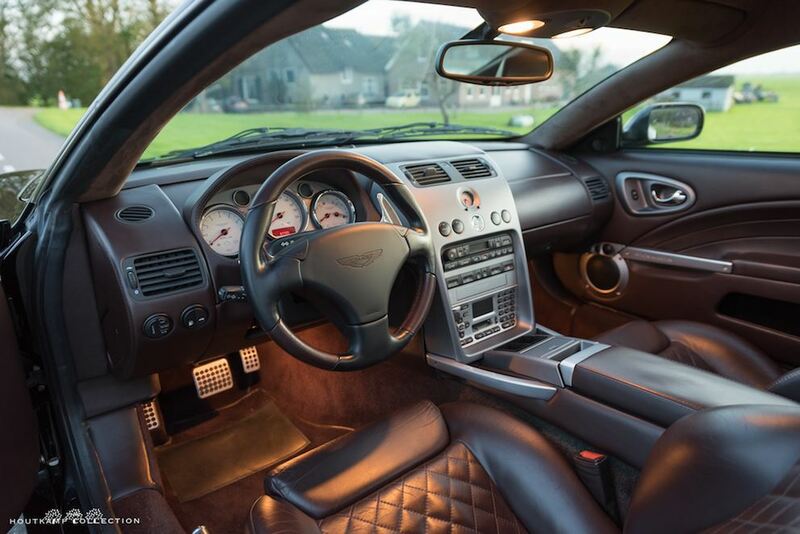 Amongst the condition of the Vanquish, the lining of the car needs some attention. 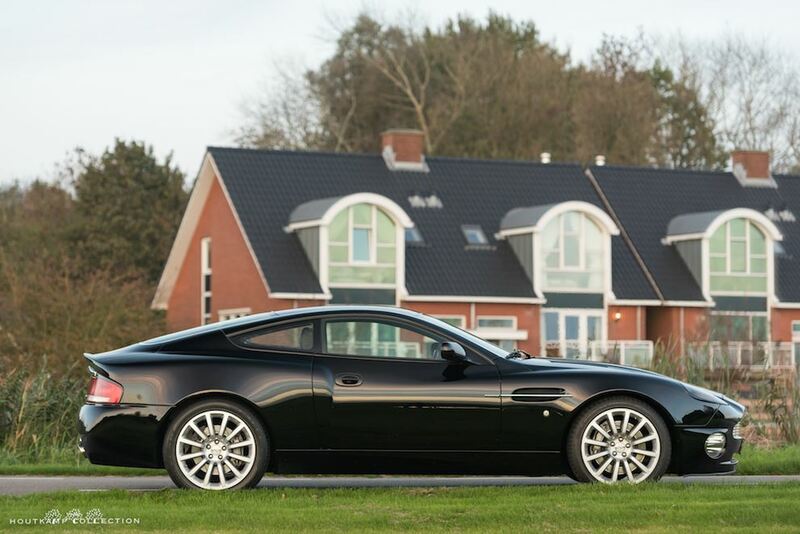 The shape of the Vanquish is extraordinary and is absolutely amazing. The front is a sort of shark nose while the back is extremely wide. When you take a seat on the drivers seat and look into the mirrors, the view is amazing as you can see the designing of the car. 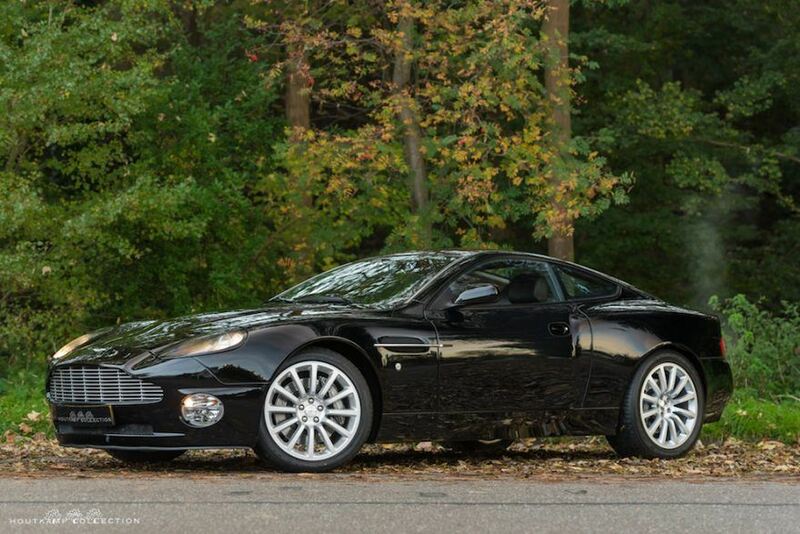 In our opinion, everything is correct on the design of a Vanquish. Also the condition is very nice. 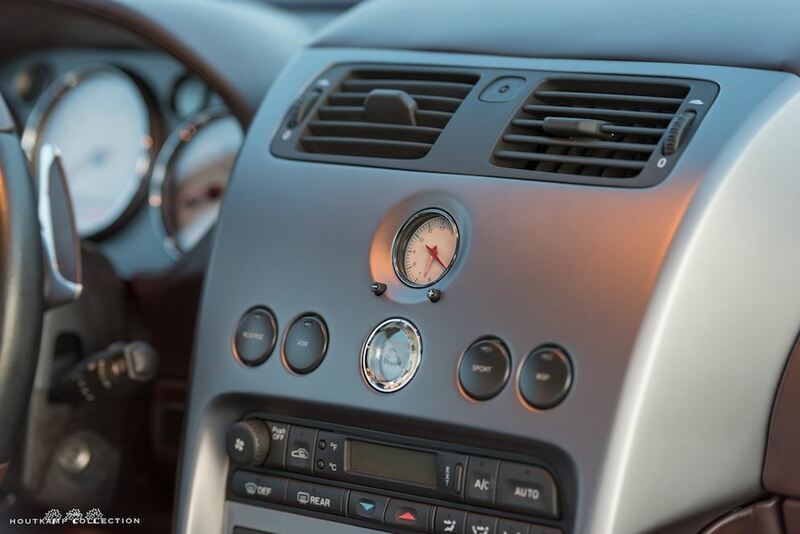 The car has been used and is off-course used for some years but the exterior condition still is extremely nice. 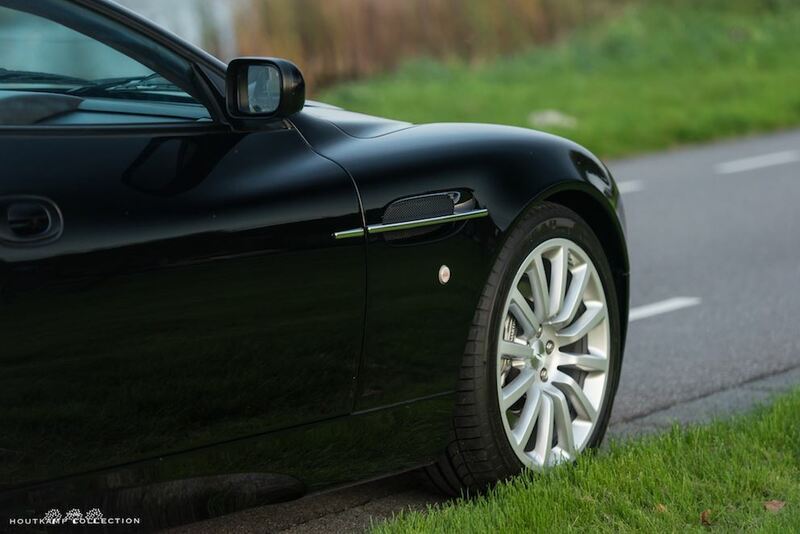 There are no dents, scratches or blemishes on the car. 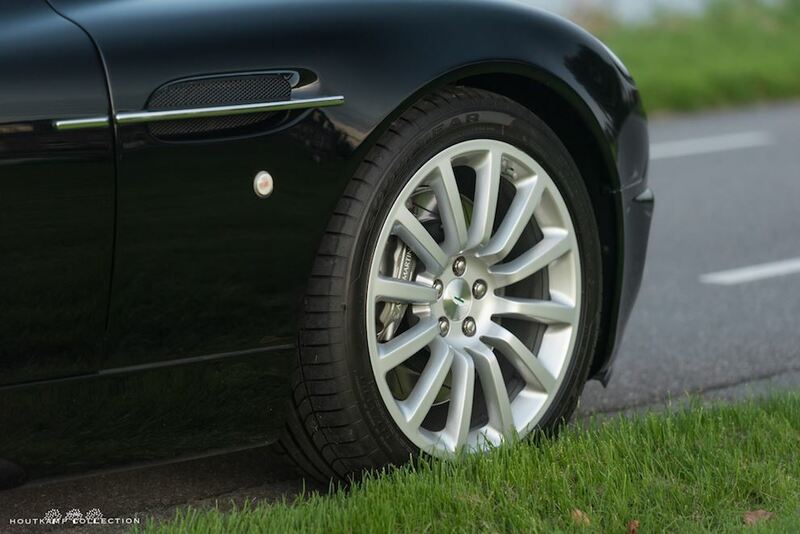 The wheels are in a very nice condition and the Vanquish benefits from relative new tires. The chrome parts are all very nice and not damaged at all. All windows including the front windows also don’t show any damages like stone chips or scratches. 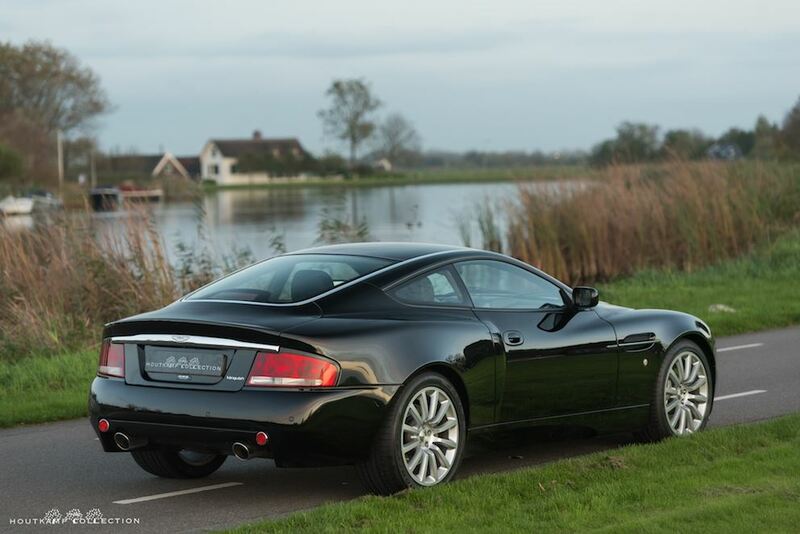 Altogether, the exterior condition of the Vanquish is very nice. 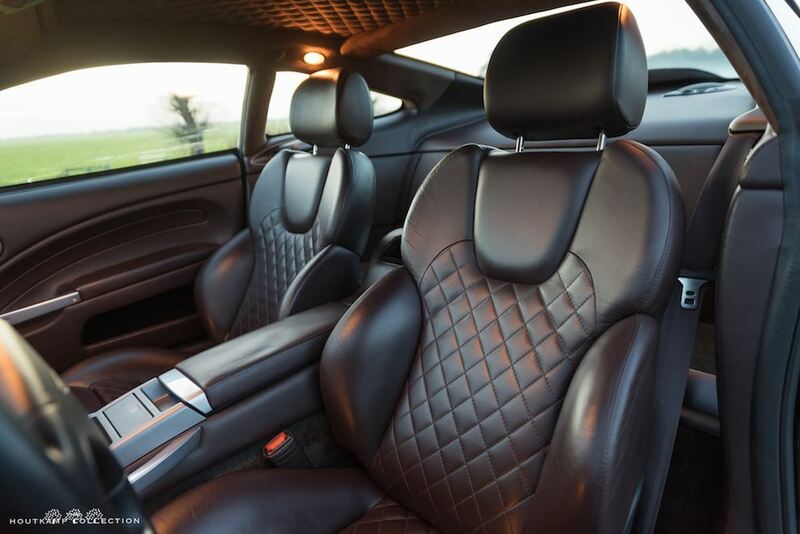 Inside, the Vanquish showed what could be achieved with beautiful hand stitched leather. The dashboard and many of the smaller interior pieces are trimmed in hide adding to the bespoke feel of the already impressive coupe. 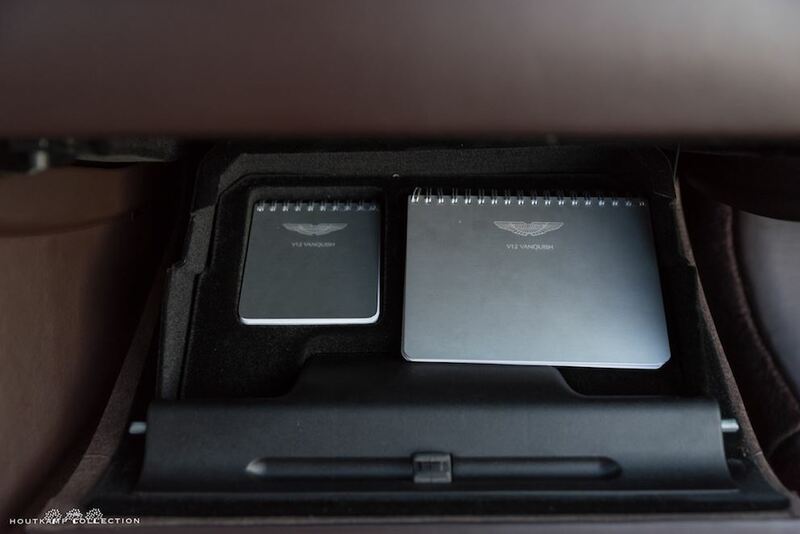 The interior is dominated by an imposing aluminium centre console extending from fascia to transmission tunnel. 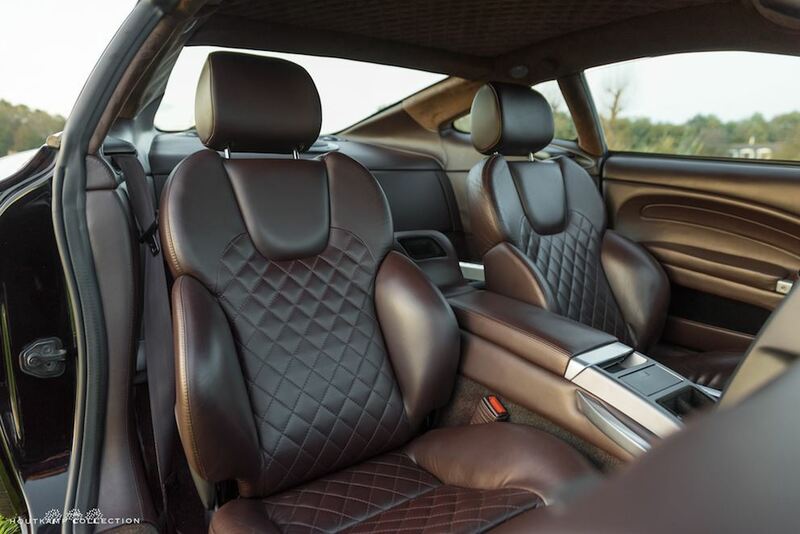 Connolly leather upholstery, Wilton carpeting and quilted Alcantara headlining emphasised the Aston Martin heritage, for despite its advanced specification, the Vanquish was built like all other Astons before it, one at a time, by hand. We have seen quite some Vanquishes over the years but this certainly is one of a kind due to the amazing color combination of the car. 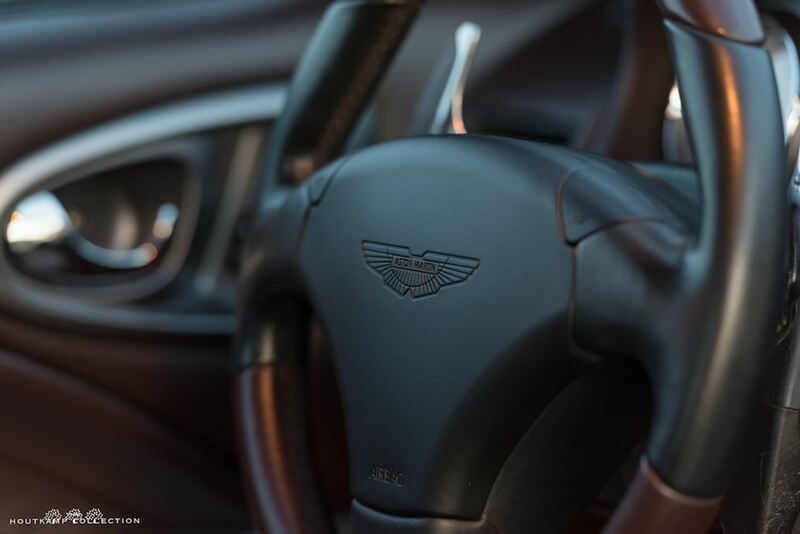 The black exterior is finished with a wonderful dark brown interior color which suits the Vanquish extremely well. Most often these cars are black or light beige inside but although this is not a usual color, it is a very beautiful color. 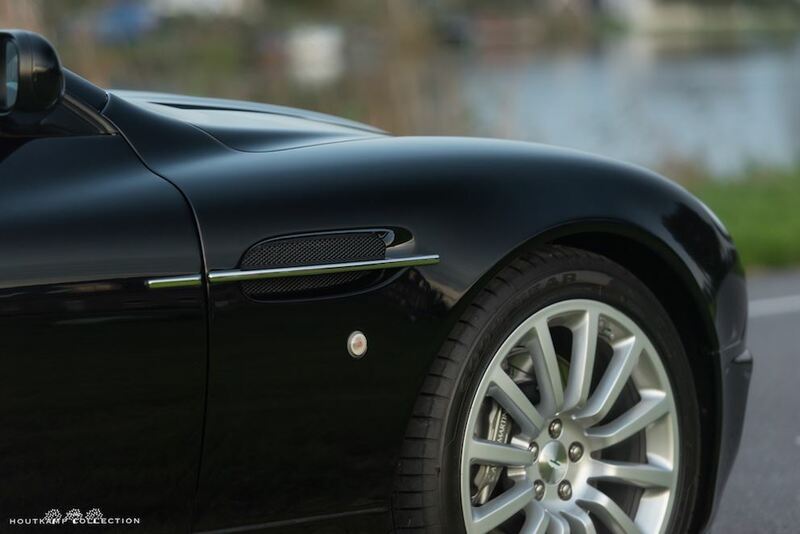 When Pierce Brosnan, aka James Bond, stepped out of his Ian Callum designed Vanquish in the 2002 film, ‘Die Another Day’, the legend was born and immediately every car enthusiast throughout the world wanted to be James Bond. 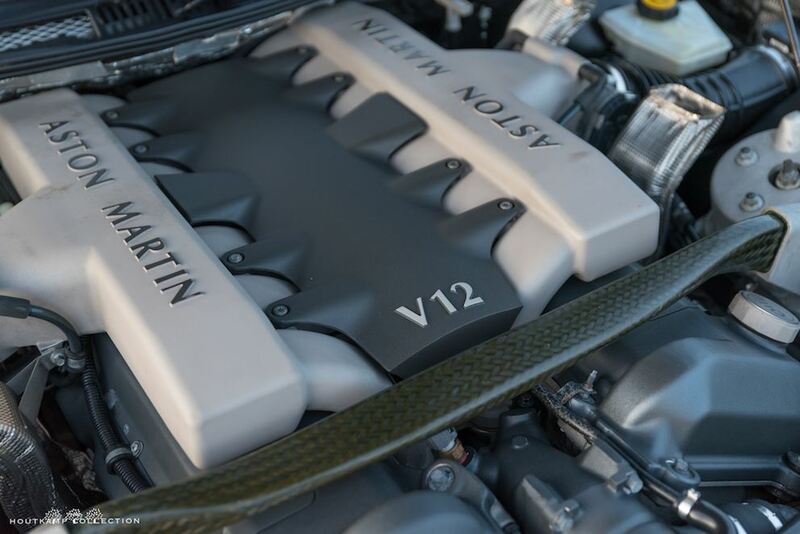 The 6.0 litre V12 produced 450bhp, the car had an early ‘flappy paddle’ electrohydraulic manual gearbox, fly by wire throttle and, of course, looks to die for! 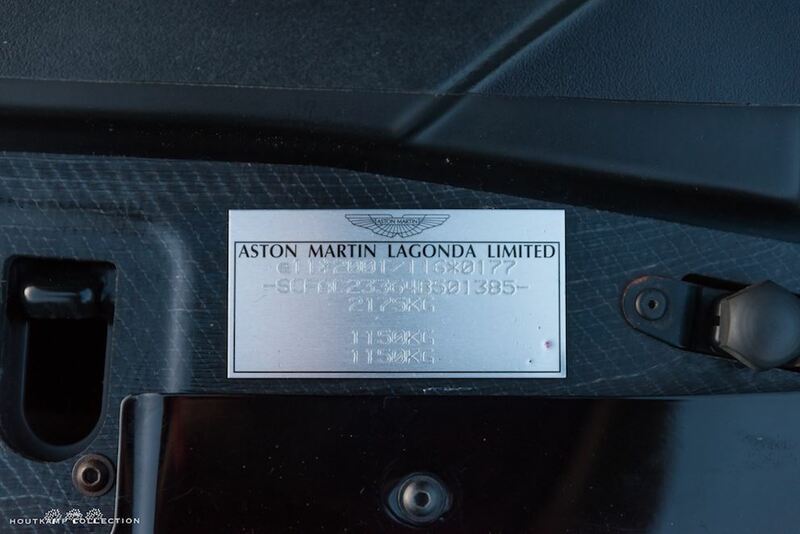 The Aston Martin legend as the ultimate British sports car was set to continue. 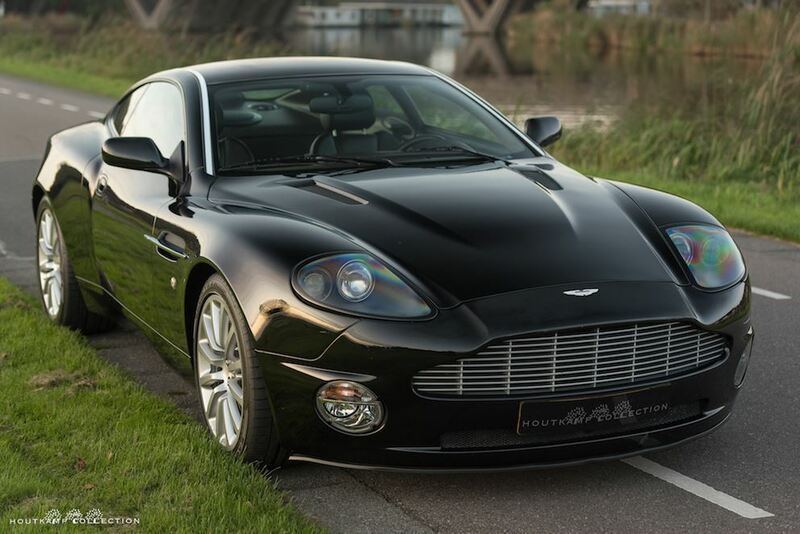 Steeped in the finest traditions of hand-built craftsmanship, even as it demonstrates 21st Century sports car performance and handling most rewardingly, the 2004 Aston Martin Vanquish is a wonderfully capable and immensely grand expression of the bespoke British sports car. This model is now becoming both collectable and recognized as a serious future classic as well as a fabulous car to drive and enjoy. Is a fine example worthy of the most serious attention today.